Home » Cameras and Lenses » What is a Mirrorless Camera? As you can see, when compared to a mirrorless camera, a DLSR has a lot more components that make up the internals of the camera. Aside from the complex mirror mechanism, there is a focusing screen, a condenser lens, pentaprism / pentamirror and other components such as a secondary mirror and a phase-detection autofocus sensor that are present on a DSLR. 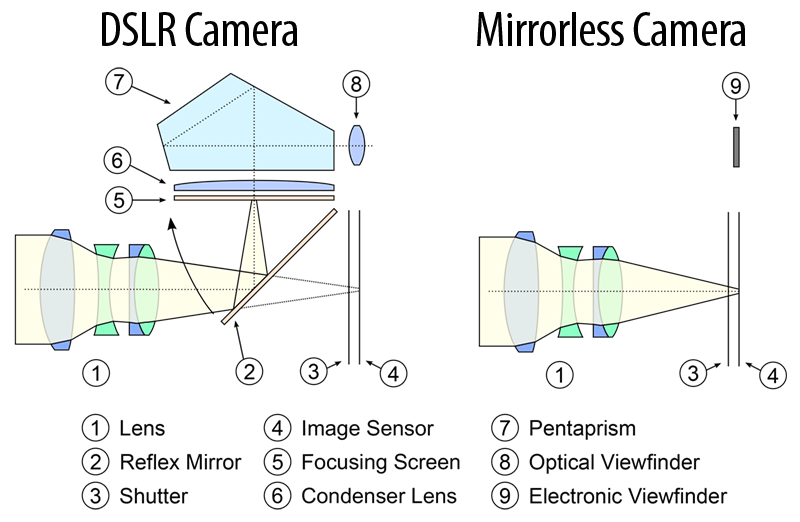 In contrast, a mirrorless camera is much simpler mechanically – light passes through the lens (#1) directly onto the image sensor (#4) and the optical viewfinder is replaced with an electronic viewfinder (#9) that replicates the image sensor. In normal operation, the mechanical camera shutter (#3) stays open and is only typically utilized at the end of exposure. Due to lack of both mirror and pentaprism, the flange distance (which is the distance between the lens mount and the image sensor) on mirrorless cameras can be shortened significantly, as the illustration above shows. Because of this, most mirrorless camera bodies are thinner and lighter compared to DSLRs. Mirrorless cameras have many advantages over DSLR cameras. Aside from the potentially lighter weight and bulk of the camera itself, the use of an electronic viewfinder can bring many benefits to photographers. Since everything is duplicated directly from the image sensor, camera settings such as white balance, saturation and contrast can be seen through the viewfinder directly and additional information overlays including live histograms can be placed within the viewfinder, allowing photographers to see exactly what they are about to take a picture of. When combined with fast contrast-detection or on-sensor phase detection system, one can take advantage of being able to zoom in on a subject to verify focus, use focus peaking, face detection and other powerful features to ensure that focus is achieved precisely with every shot. When shooting in daylight conditions, one can utilize the electronic viewfinder to review images, instead of relying on the back LCD of the camera. At the same time, mirrorless cameras have their list of disadvantages. First, the electronic viewfinder can only be active when the camera is turned on and power is provided to the image sensor, which can significantly affect the battery life of a camera. Second, electronic viewfinders can have noticeable lag, blackouts and high contrast, which can make it difficult for some photographers to get used to. When it comes to autofocus, although the latest mirrorless camera models can be very fast and accurate, they still do not do as well when shooting fast action, especially in low-light situations. We wrote a detailed post that compares mirrorless cameras to DSLRs, so if you would like to find out more about the pros and cons of each, please take a look at our Mirrorless vs DSLR article. All you said is right! My choice in mirrorless came when looking for a new camera after just three years of no longer getting support for my mirrored APS-C camera BUT still works great. After learning about full frame I went looking and found a mirrorless at 1/2 price and that with adapters (inexpensive) I could use any lens I could get my hands on from my film cameras to my DSLR, Which allowed be to save up for lenses while still using! Also the new mirrorless manufactures bring more power to their on board computers, I believe, like in camera apps like using a program that uses the sensor as a graduated filter or even the properties of a tilt lens or adding 5 axis in camera image stabilization. I think what it is is they are thinking out of the box! Lastly with all that mirror movement your sensor gets duty faster (due to lubricants. not thought of being needed). I know this issue is not seen so much due to not going beyond f/16. But when playing with image detail and depth of field and going up to f/22 and Lr not have that dust/object removal in the early days it was here, Photography Life, that I learned to clean my sensor and keep the inside part of the lens clean and what caused the spots. What was taken off the the mirrorless camera body was put back on the lens at least for Sony. There is no weight advantage when that is considered along with extra batteries or when the battery back has been added. True, there is the lag and hunt in low light situations. To optimize your camera, you need to purchase native lenses. The lens adapters are expensive and add more weight and some lose functionality like AF. This whole topic of mirror/mirror-less puzzles me. I have three Nikon DSLRs and one Fujifilm S3 Pro (an older Nikon body cobbled together with a peculiar Fuji sensor that produces interesting images) – these all have a mirror. Then one day I bought a used Olympus mirror-less camera – the OMD EM5 – and some prime and zoom lens, and now have two more Olympus mirror-less cameras, to be honest when I go anywhere now with camera in tow, its an Olympus – and I would be the first one to confess, the autofocus on the Nikons is probably superior, the image quality…likely superior, and noise in low light(?) the Nikon produces a cleaner image I think – so this is what puzzles me, I prefer the Olympus and frankly , I am having a lot of fun with the smaller mirror-less cameras. The images I make with the Olympus, are…. fine,….. my audience? Friends and relatives. Well, for what its worth …that’s where I’m at. Well when it comes to the old adage “the best camera is the one you have with you”, a small mirrorless camera can get an advantage over a larger DSLR. For professionals going to shoot a specific subject, the choice of camera tends to be very focused and deliberate, but for the rest of us, the camera we can easily toss in a bag/pocket when leaving home tends to have an advantage. Shooting a camera is about more than image “quality” too. Heck, if it weren’t, there wouldn’t be people out there still shooting film. With the rise of digital, getting “sharp” images has become the holy grail of photography, but a good photo is about more than just defined edges. A “good photo” to most of us is a photo we enjoy looking at or that makes us feel something, and a “good camera” is one that we enjoy shooting with and can produce those images. You are talking of one implementing image inversion optically while the other is employing electronic means. It is actually very easy to electronically reverse the optical image. You see, the optical image on the sensor in a mirrorless camera can easily be corrected electronically and then sent to the EVF. do you have an article on best mirrorless cameras?